Of course, at 6 months Karly was not too impressed with her basket, but she will be some day. 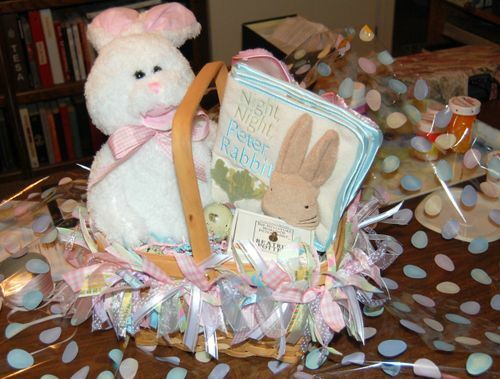 The cute stuffed bunny hops and sings "Here Comes Peter Cottontail". The cloth book (purchased, not home made by Nana) has a different Beatrix Potter character on each page. I love BP and have made her stories a central part of storytime at Nana's. I gave her one of my treasures, a little box with a tiny pull out drawer filled with miniature Potter books. I hope Karly will love these stories as much as the three grandsons have.